We would like to invite Triathletes from all over the world to come to Barbados to participate in our 29th National Barbados Triathlon on Sunday 13th October 2019. Non-Resident participants are required to enter online using Race Roster, click here. Residents can enter via by completing this form – Registration Form, click here. Make a holiday of it, check out the other activities on offer such as Swim Smooth Clinics group swims and rides and social events all available on race roster. Barbados has many different types of accommodation which will suit all budgets. Below is a list of hotels that have offered accommodation to visiting triathletes in the past. Feel free to contact us for other recommendations. Your age on 31st December 2019 is your race age. Each entrant will receive a Swim Cap & Race Numbers. 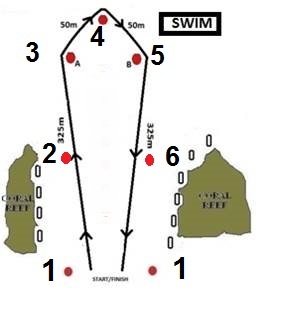 The Race Briefing will be held at the race site (Brandon’s Beach) on Saturday 12th October 2019 (evening before the race) at 4:30PM. No Race entry at the briefing. Race fees are to be paid prior to the Briefing. At the Briefing, you will receive your Race Kit containing your Race Numbers, Swim Cap, & other race related information. The Race Director/Referee will explain all three sections of the Course and Transition area. Instructions will be repeated on Race morning, 15 minutes before the Start. Numbers must be fixed to the bike and shirt as approved by the Race Director (bike frame post & front of body for the Relay runners. All competitors will be body marked on arm & legs. All repairs during an event shall be performed by the individual racer. Racers must complete the event on the same bicycle upon which he/she began the event. Any repairs or changes must be done with equipment carried by the individual racer. This event is not Draft legal. All competitors must attend the pre-race briefing and must familiarize themselves with the course. Time penalty of 2 minutes will be assessed for not attending the briefing. Any Foul riding, unsportsmanlike behaviour or abusive languages may result in warning, penalties, relegation, and/or disqualification. Cyclist failing to stay left of middle of road may be warned, penalized, relegated, and/or disqualified. Any modified instructions shall be verbally announced at the race briefing, repeated 15 minutes before the start of the race and shall apply to that race. The Race Director’s & Race Referee’s decisions are final. a. Approved hard helmet; b. Enclosed shoes on bike; c. Jersey or top (no bare torso).